Remember when Frank Stella and co. started using shaped canvases and we were all like, "whoa, conceptual, breaking free of the frame, flatness, formal..."? Well our friends at McSweeney's are continuing their tradition of making art and books become one. 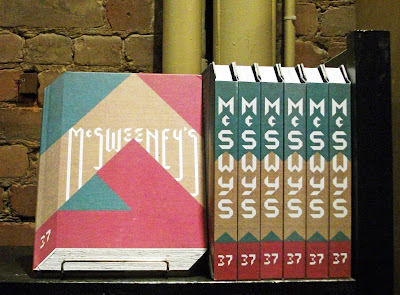 They've reshaped the geometry of the book, cutting off the covers and pages of McSweeney's Quarterly Concern #37 at the corners and now we no longer think about books and form in the same way, do we? It's all about the realignment of the book industry. Literacy is at an all time high. Reading is in great shape. Topping the list of contributors to this sensuous volume: Jonathan Franzen, Joyce Carol Oates, Mike Sacks, and John Sayles.